The California mountain community of Bear Valley Springs is overrun by the endangered condor. (CNN) – Forty years after the introduction of the Endangered Species Act, the California Condor is trying to reclaim its home. The problem is, humans have moved in. [0:51] "There are about 420 birds in the world and a little over half of that population are in the wild." 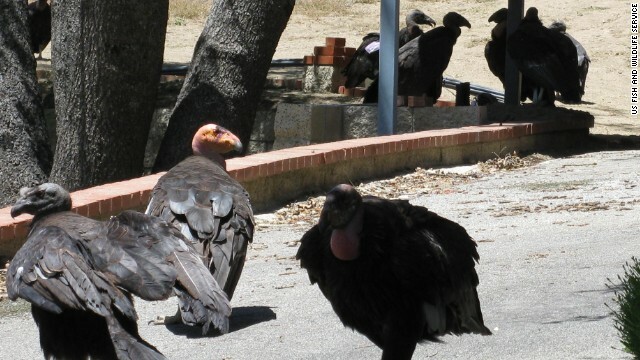 Joseph Brandt, biologist with the US Fish and Wildlife Service's condor recovery program, said for the second year in a row, California condors have come back to roost in the mountain community of Bear Valley Springs, about 90 miles north of Los Angeles. Residents say the curious scavenger birds are wreaking havoc. [1:26] "They’ll take apart anything plastic or canvas and just shred it. They shred screen doors." These birds, that stand four-feet tall with wing spans of up to eight feet, can create quite a mess. One woman called the Bear Valley Springs police department to say her car was vandalized. The vandals it turns out, were condors and the graffiti painted all over the car was…not paint. I thought this was reasonably balanced. The condors are capable of doing quite a lot of damage. For most folks the reason they live in a place like Bear Valley Springs is because they like living in a beautiful natural setting. This is a historic condor roost site. Learning to live with condors is much like learning to live with bears. If the things that attract condors are put away and motion sensor sprinklers are installed the birds stop going to these houses. If loose hoses, trash and tarps are left out the condors love to mess with these things. The worry is that the birds will become too comfortable around the houses and that they might get hurt. There is a certain homeowner responsibility to keep this from happening and keeping the yard tidy will go a long ways towards solving the problems. Wow. One-sided story more suited to FOX News than CNN. There are protected animals all over the country, congrats on cherry-picking two for your insanely out-of-balance ESA hatchet job. White people are the endangered species of this century. this is not left vs right, GOP vs Dems, Socialism vs liberty. This is war against White people.